Boden Ladies Blue Short Sleeve Embroidered Top, Size 18, Fab Condition as only worn a handful of times . Comes from a smoke and pet free home . Please take a look at my other items , I’m happy to combine postage , please message prior to purchases to check that it is possible due to weights/ sizes etc. Women's Pink Boden Top Size 10 Bnwot. Dispatched with Royal Mail 2nd Class. 3/4 length sleeves and lower at the back makes this a very versatile top - perfect for in between seasons for work or play. Size 10 never worn. Lightweight top, gorgeous colour, velvet trim. Length 26”, pit to pit 19.5-23” max, under arm length 12.5”, across elasticated band 14” relaxed, 23” max. Great condition. LOVELY BODEN SIZE 6 NAVY COTTON VEST TOP WITH PRETTY EMBROIDERY AT THE NECK. BARELY WORN SO IN EXCELLENT CONDITION. Ladies BODEN Cream Cotton Top Back Button Detailing Size 12 VGC. Short sleeves. Embroidered, see through material with cream panels. George our back detailing with buttons. The measurements are pit to pit approx 20 inches and length approx 24 inches. Great quality and condition. Please ask if you need any more information or measurements. Please note I am away from Wednesday 24th April to Wednesday 1st May. The top will be sent out second class signed for on the 2nd May. Please check out my other items, including Boden, I am happy to combine postage. Gorgeous top bought new last year and sadly no longer fits. Pleated detail round neck with button fastening to back. Short sleeves. Pale blue background with red spots. Measures 50cms underarm to underarm, 57cms side seam to side seam around hem and 63cms back of neck to hem. 61% viscose, 39% silk. Machine washable. No stains or damage. Smoke free home with dogs. Lovely Boden Top 14. Condition is Used but excellent. Perfect for summer. Please check out the photos and feel free to contact me with any questions . From a pet free and smoke free home. Dispatched with Royal Mail 2nd Class. A very nice used Boden black dot white short sleeve shirt made in China UK size 14 as shown in the attached photographs. Lovely Boden Cotton Top Size 14 Excellent Condition. Lovely soft cotton. Floral print in dusky pink with navy and orange tiny floral print.Fairly loose style that gives a very flattering fit. Some gathers to the neckline and there is also a tassel tie in pink and orange.Size is 14 and underarm to underarm measurement is 23 inches. Just pulls over the head. Post to UK only, no returns. Please check out my other items, many still used, from brands such as Boden, Seasalt, White Stuff, Fat Face and Per Una/ Marks and Spencer. Am happy to combine postage on multiple purchases. Loads more items being listed over the coming weeks as am having a massive sort out of my clothes. Gorgeous top bought new last year and sadly no longer fits. Pleated detail round neck with button fastening to back. Short sleeves. Ivory background with green, pink and navy flowers. Measures 50cms underarm to underarm, 57cms side seam to side seam around hem and 63cms back of neck to hem. 61% viscose, 39% silk. Machine washable. No stains or damage. Smoke free home with dogs. Boden Ladies Top - White - Cotton - 3/4 Sleeves - 3 Button Fastening - 2 Front Pockets - Size 18 - New. Dispatched with Royal Mail 2nd Class. Three quarter length sleeves with button. Lovely Cotton Colourful Ladies Boden blouse /shirt size 12 Condition is Used Clean smoke free home Please see our other auctions for some fab buys Dispatched with Royal Mail 2nd Class. Boden Ladies White Bell Sleeve Top, Size 18. Condition is Used. Dispatched with Royal Mail 2nd Class, only worn once, not my style, didn't suit me, I'm excellent condition, small blue pen mark (see pic) saw it as I was listing this item! Brand New Boden Blouse. Size 14 . With Tags . Condition is New with tags. Dispatched with Royal Mail 1st Class. Purchased last year but never worn . Brand New with tags . Boden white cotton broderie anglaise top. pit to pit - 17". length - 24". New listingBoden size 10 long sleeve top. Green with a floral pattern. Boden size 10 long sleeve top. Green with a floral pattern.. Condition is Used. Dispatched with Royal Mail 1st Class. Gorgeous top bought new last year and sadly no longer fits. Navy background with ivory, pink and black floral pattern. Pleats to front neckline and button fastening to neck at back. 61% viscose, 39% silk. Machine washable. Clean with no stains or damage. Smoke free home with dogs. Measures 53cms side seam to side seam and 60cms back of neck to hem. Boden Breton Stripe T Shirt Size 10. Good condition. Boden lined Summer Top Size 14. Label removed but never worn, only tried on. Sunglasses design. Side zip. Dispatched with Royal Mail 2nd Class signed for. From a smoke free pet free home. Please see my other items. It has been worn but still in great condition with loads of wear left. There are green and pink beads around the neckline. Boden Top 14. Condition is Used. Please check out the photos and feel free to contact me with any questions. From a pet free and smoke free home. Dispatched with Royal Mail 2nd Class. New Cotton Top By Boden Size 14. Pretty Top. Stunning tunic top in green and white to create a really fresh look. The scooped neck leads to elasticated ruching at the placket of 5 buttons. It has edged capped sleeves. Typical Boden quality and styling. Boden Size 12 Floral Sleeveless Top . Condition is Used. Lovely colours button back. Small slits at bottom.Hardly worn so in lovely conditions. 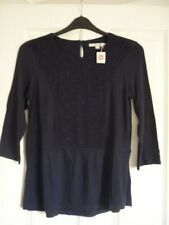 Womans Boden navy blue top size 12, faux wrap over. Excellent condition. From a smoke and pet free home. UK postage only. Boden Jersey Turquoise Shirt Size 12 Summer. Condition is Used. Dispatched with Royal Mail 1st Class. Lovely little Cotton sleeveless top from Boden, size 14R. The top is unlined and is 100% Cotton. Colour is Turquoise with pink/red/brown/white pretty pattern. There is a side zip and length from neck to hem is 25" and 18" across armpit to armpit. In great condition as hardly worn and usual Boden quality. Thank you for looking. Boden Stunning Poppy Lace Top/ Blouse 12/14? Boden Stunning Top/ Blouse 12/14? In immaculate condition, lined from just above bust line, heavy ornate fabric ideal for a special spring/ summer occasion. Scalloped along hemline and cuffs with delicate lacework. Underarm measures 19 ins length 24 ins. Please message with any questions and take a look at my other items as I am always happy to combine postage. Please note that I am not likeable for items lost in the post , I always get proof of postage which I can forward on in the event of a problem. BODEN LADIES GORGEOUS white cotton mix vest top. UK size 8. WL901 BRAND NEW. Boden Ladies GORGEOUS Ruched Top WO050 SIZE 10 ORANGE. BRAND NEW. The Boden brand was established in the UK in 1991 by Johnnie Boden and has been a familiar name in fashion ever since. They have wide range of clothing, shoes and accessories for women and are known for their commitment to ethical trading. Boden's distinctive style of bright colours and bold patterns help to create statement pieces which can be mixed and matched with capsule wardrobe pieces, which are suitable for work, every-day wear, or an evening out. This is certainly true for Boden's women's tops and shirts, which are available in a variety of fabrics, styles and colours which will complement a wide range of women's trousers and skirts. Boden's range of tops are made in several different styles and include shirts, blouses, tunics, wrap tops and camisoles. They can be sleeveless, long-sleeved, or three-quarter sleeved, and the colour options, prints and patterns are extensive. Boden clothing comes in a variety of fabrics including cotton, viscose and wool. You should follow the manufacturer's instructions for laundering your top or shirt to help prolong your item's life. Colours include the staple blacks and whites, bright colour block and the bold prints which Boden has become renowned for. Boden women's clothing range continues to be popular. The versatility of the individual pieces as well as the quality manufacturing has created a growing army of Boden fans. When you're looking for a change from plain shirts and tops and want to add some colour to your work or casual wardrobe, Boden could be a good option for you.